This article was published in the North Island Gazette July 24, 2014. When the Hudson’s Bay Company (HBC) established Fort Rupert in the mid 1800s their immediate interest was in mining coal for use on the new steamships serving the California gold rush. It soon became apparent that a reliable supply of coal was going to be difficult to obtain in the area, and the HBC tried to break even on Fort Rupert through trade with First Nations. There were only about four coastal HBC trading posts at that time, and First Nations from coastal and interior areas travelled great distances to bring furs, fish, and other items to barter. Fort Rupert faced stiff competition from trading vessels, which would anchor in Quatsino Sound, Shushartie or Nahwitti and intercept First Nations who would barter until they had obtained the best trade for their furs. Fort Rupert did not trade liquor, and employees lamented to their superiors at Fort Victoria that the best furs often passed them by because First Nations would bypass Fort Rupert and trade at Fort Victoria or in the United States, where it was not uncommon for half the value of a trade to be redeemed in rum. One of the most popular trading items from the HBC were their iconic ‘point blankets.’ Point blankets originated in the late 1700s, when the HBC purchased large quantities of blankets from mills in England in various widths, ranging from 2’ 8” to 8’ wide. In order that the size of the blankets could be ascertained when the blanket was folded up, a series of lines were standardized which were woven into the blanket denoting its size. A 1pt blanket was the smallest, and a 3pt blanket was the largest. Blankets served as a form of currency, and the value of other items was often measured in terms of the number of blankets for which an item could be traded. A sea otter pelt, for example, might be worth seven 2 1/2 point blankets. Some of the most iconic images of the potlatch showed heaps of trade goods amassed prior to a potlatch for distribution. When bartering for a bride or making an important announcement, it was not unusual for hundreds or even thousands of HBC blankets to be piled in front of the First Nations village at ‘Tsakis to be given away by local chiefs as a show of wealth and generosity. Chiefs at 'Tsakis at Fort Rupert with blankets - circa 1898. 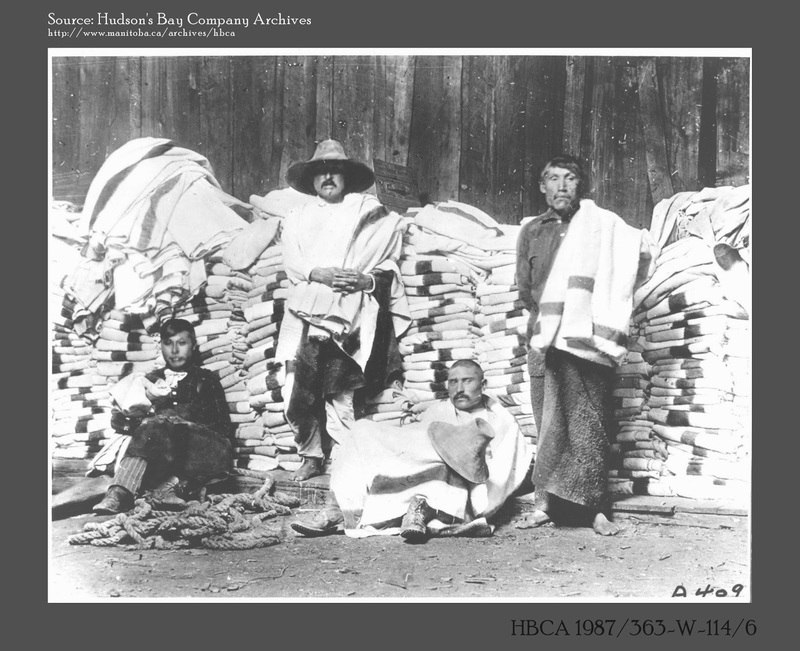 One of the more controversial issues related to HBC blankets had to do with the smallpox outbreak on the Coast in the mid 1800s, when there were reports that unscrupulous traders removed blankets from villages stricken with the disease and re-sold them, in effect transmitting the disease to new populations. Correspondence from Fort Rupert to Victoria at one point noted that the daughter of a South Island HBC employee had been accidentally kidnapped at San Juan (probably as a part of ongoing raids between various First Nations). Her captor paddled her all the way to Fort Rupert, but felt that he should probably give her back, and returned her scared but in good condition. The clerk at Fort Rupert gave him six HBC point blankets to thank him for her safe return.